Yes, I REALLY do like scrapbook pages with one photo. I’m not against lots of photos on a page, but I find I can capture a memory with one favorite photo that talks to ME and that’s what scrapbooking is all about for me. My pages talk to me, they’re my memories. I can’t speak for anyone else, only me and so I scrap for myself. Yes, I’m working on books for my kids, but they’ll be filled with my memories of those times – they’ll have to fill in with their own memories if they like. Recently I found myself so uninspired that every time I went to my studio (think spare bedroom) I just sat there staring at all my stuff. I just couldn’t get any kind of groove going and I was missing the boat on classes and something needed to happen – quickly! 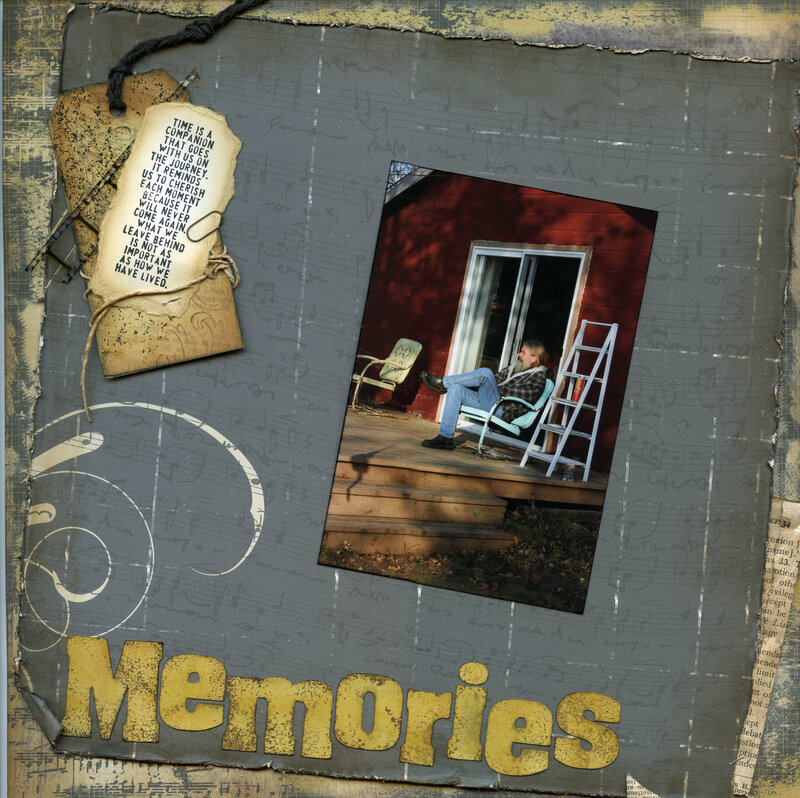 When I got done blaming the weather and anything else I could think of I finally bucked up and decided to go back to my roots – scrapbooking. It’s where it all started for me and it’s something I really enjoy and don’t do much of. Now mind you, I’m not the type of scrapbooker who feels the need to scrap every photo. I scrap my favorites; photos that ‘move’ me and invoke some special memory or make me sit and ponder ‘what if.’ This layout started in my mind as a page for my oldest son and his beloved Zoe who passed recently. Zoe was his buddy for 15 years; sat beside him through failed relationships, job losses and more. It was going to go into his book. But as it turned out – or didn’t – that will be for another day. It just wasn’t coming together so I finally started over with the same paper and a whole new idea. I would simply make the layout and call it good; the photo would come later. That seemed to work better. I enjoyed creating this page and am pleased with the layout and design. Then I came across this wonderful photo of my brother Randy and it was perfect! You gotta love it when it works! I also really like single-pic pages, and this masculine one is right up my alley. Love the way you’ve tagged the sentiment, too. Thanks Marjie! i love that particular sentiment. Another amazing page Linda, you are so wonderfully talented. Love seeing all these great techniques on one page. I believe that you can say it all with one picture to. Thanks Candy, I was so happy with the way it turned out and I think I can cram the techniques into 2 hours! What a wonderful page-I love it. Someday I’m going to challenge myself to do a one-pic-wonder. I love your work. Thanks Sandy! Great seeing you the other day – if only briefly! I so agree Elaine! Hope you are well – miss you!